NYC, 02/28/2019, 2:00PM. 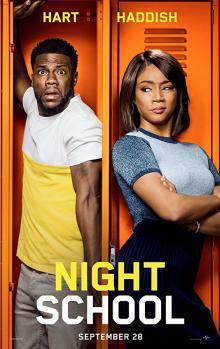 Night School (2018): High school dropouts coming back to school. 111 min. Director: Malcolm D. Lee. Starring Kevin Hart, Tiffany Haddish, Rob Riggle. Night School has grossed over $103 million worldwide. Principal photography on the film began in Atlanta, Georgia in September 2017.